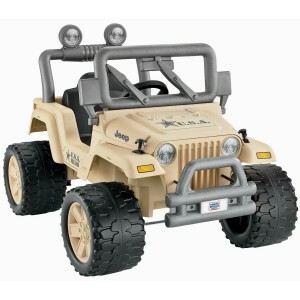 Jeep Power Wheels are cool and a lot of fun! They look exactly like the ones for adults and kids absolutely love them! The best thing about the electric jeep for kids is that they usually fit two children! Parents love that! This cute black Power Wheels jeep makes awesome sound effects and it rides on the toughest pavements and grass! Children love to take their baby brothers and sisters out for a ride on this cute ride-on jeep! It will fit two kids ages 2 to 6! Enjoy! 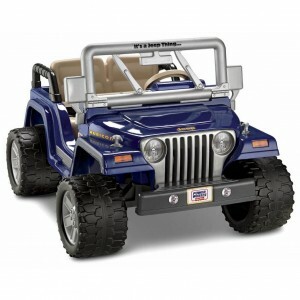 This blue Power Wheels jeep Wrangler is another very popular ride-on jeep for kids! It is gorgeous and looks just like daddy’s! It comes with a spacious rear storage compartment and kids love that! It will fit two kids and they will play for hours on end! 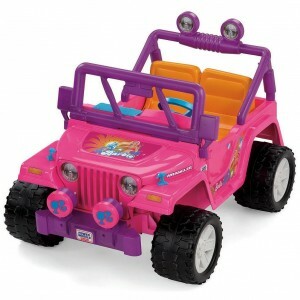 This cute Barbie Power Wheels electric jeep is a big hit among little girls and their parents! It is adorable!! The best thing about it, besides being pink and purple, is that it fits two kids! Parents love that! The big sisters can take their baby sisters out for a ride! They feel so proud doing that! The max speed is 5mph so it is very safe. This cute Barbie jeep will also ride through grass and other hard surfaces! 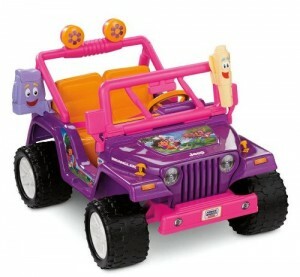 We couldn’t forget this cute purple Power Wheels Dora the Explorer electric jeep! Little girls love it!! It is very cute! It also fits two little girls ages 3 to 5 years old and it rides through grass and rough pavements. The max speed is 5mph. Have fun! 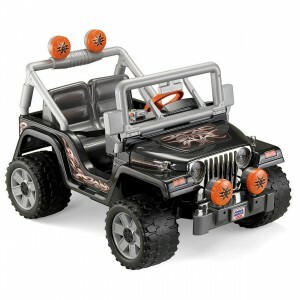 This Fisher-Price Power Wheels jeep Hurricane is one of the most luxurious jeep Power Wheels for kids around! It feels and looks like a real adult Jeep and comes with a real steering wheel and foot pedal. It also has a cup holder and a real working FM radio! It will ride through dirt, mud, water puddles and grass! It’s a great toy for kids 3 to 5 years old! Wow! This Power Wheels Camo Jeep is absolutely gorgeous!! Boys are going to love it!! 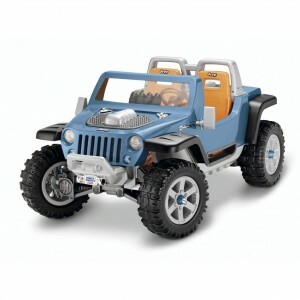 Of all the cute electric cars for toddlers electric jeeps are boys’ favorite! This ultra-cool camo jeep has a cool military design and will handle all kinds of rough terrains! It fits boys ages 2 to 6 years old.